“There’s just too many people signing up. I’m worried I won’t be able to take on more customers,” professed the young startup founder at a recent mentor meeting. “You see, this is a good problem to have!” the mentor proclaimed. In less than 10 years Australia’s technology startup sector has gone from very little activity to an explosion of people and investment — the ecosystem Down Under is now one of the fastest-growing startup sectors globally. If you don’t live in Australia it’s hard to describe how different it is today compared with even five years ago (and how quick we are to take it for granted). You could count the number of accelerators on one hand (four). We’ve had three billion-dollar exits in the past 12 months, the biggest being Aconex at $1.6 billion. I started a university accelerator program, and at our first demo day we had two to three VC investors attend. None of them invested in pre-seed companies. Staff at multiple universities told me, “No students are interested in entrepreneurship. Why bother with student programs?” or, “Don’t waste your time. Young people in Australia are not interested in starting a startup”. Australia struggled to understand why entrepreneurship was important and why they should care. Higher education in Australia has completely changed. Our last demo day at Sydney University had over 20 VCs and investors attend, representing over $1.5 billion in funds under management. If you’re a university and don’t have “startup strategy”, it’s dead in the water. And students are paying attention. For the first time, I have first-year students pitching me their startup ideas before university has even started. I’ve started to hear startups compare themselves to other established technology companies in Australia! Universities are investing heavily in entrepreneurship and commercialisation. Initiatives are coming from either bottom-up (e.g. student initiatives like Textbook Ventures) or top-down from senior executives. For example, UTS, Monash and UNSW now have deputy vice-chancellors of entrepreneurship. New Venture Institute of Flinders University and iAccelerate of Wollongong University, which are multimillion-dollar programs with new facilities and a wider community focus. 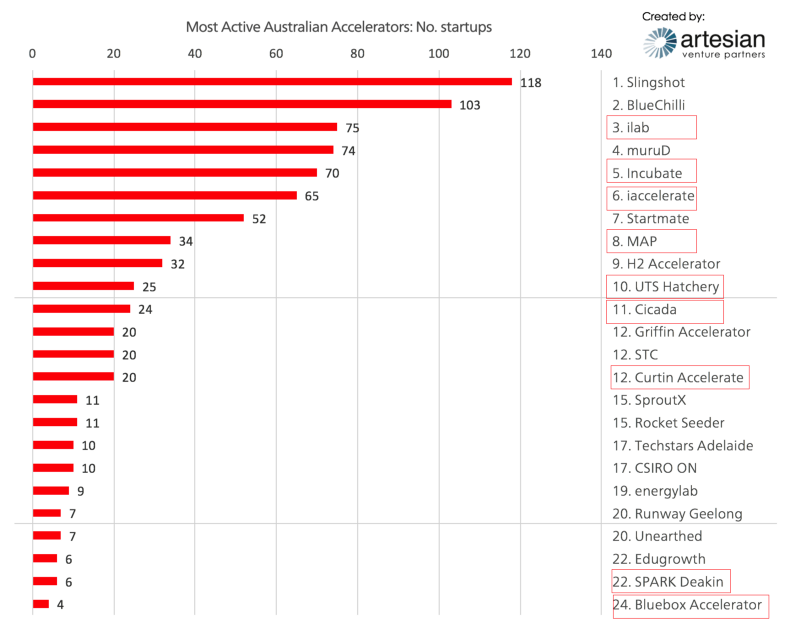 Australia’s most active accelerators. Red highlighted programs are university affiliated. Source: Artesian. 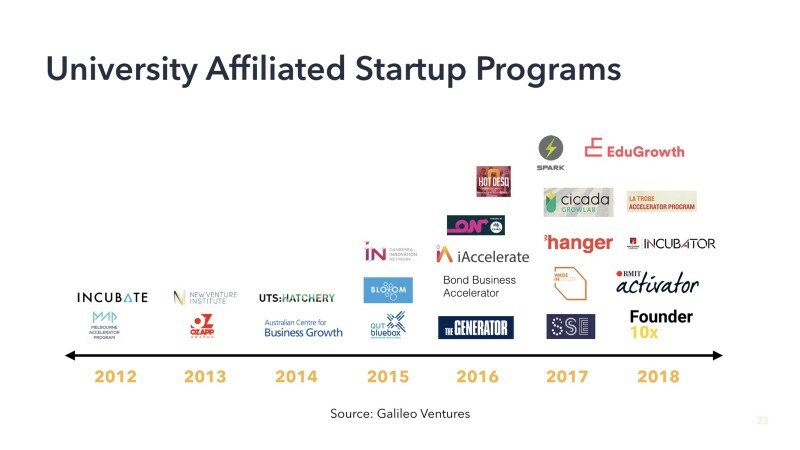 Half of Australia’s most active accelerators are university affiliated.⁶ These programs are helping seed Australia’s startup sector by supporting entrepreneurs at a very early stage (usually idea to minimum viable product/initial customers). No-one can argue that these are not great signs, but many will point out the relatively large number of new players in the space. “They’re inexperienced” or, “they don’t have good mentors”, etc. But as the ecosystem matures and programs graduate more startups, the whole sector will benefit. While there are always lots of problems, some are good problems to have. This piece was originally published on Medium and was republished with permission. Dominic Creardon, Boom Town, Baby!